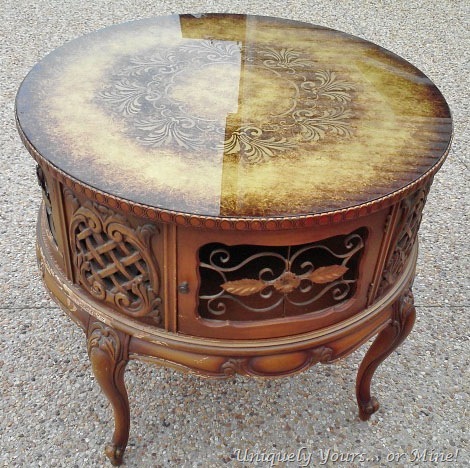 Unique French Side Table Revived – Uniquely Yours… or Mine! 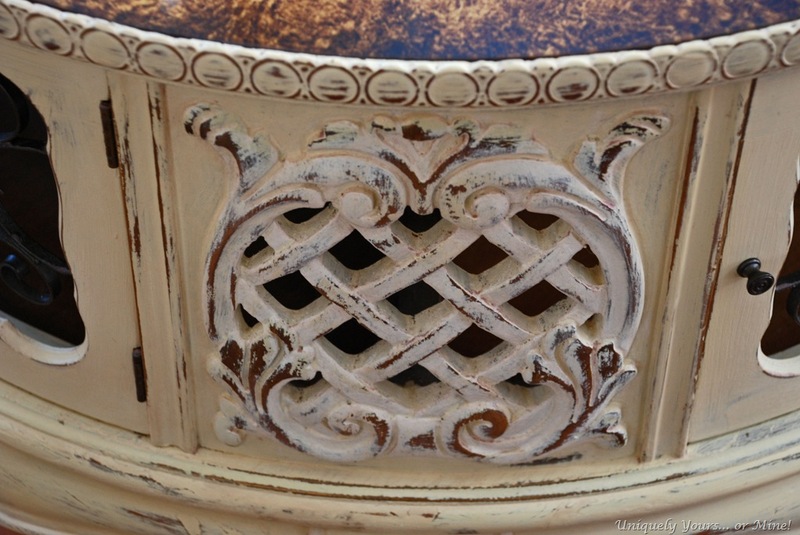 I just LOVE this round French table! Not only is it pretty to look at but it has storage too… what?! 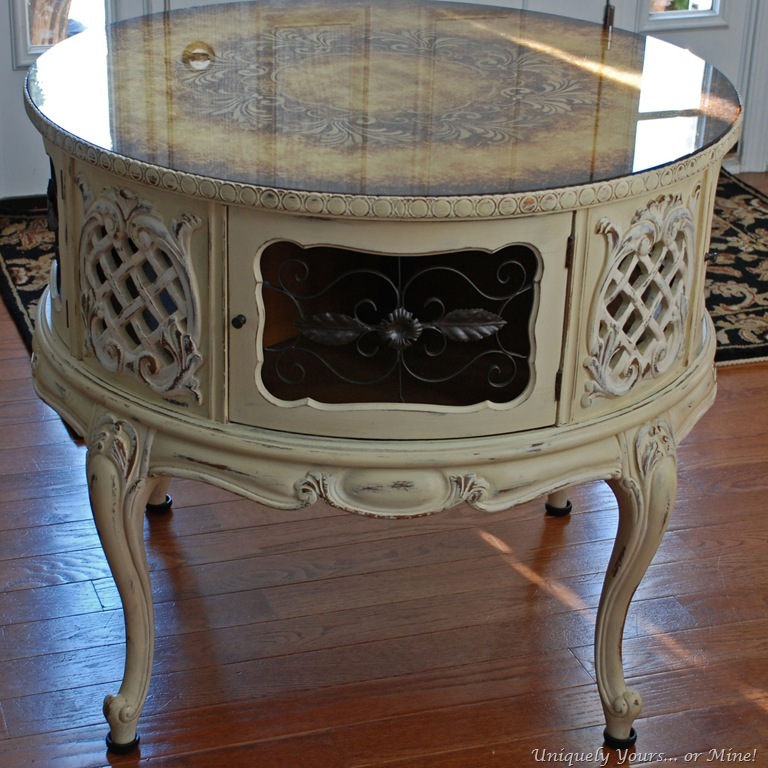 The glass top has this wonderful treatment to the underside… however it is missing a knob and the trim around the top has some damage, but it is in great structural condition so I would say an overall fabulous piece! It took me some time to figure out what colors to use, but I think in the end it turned out beautiful! The color palette I chose was Cream and Pure White (for the highlights) Annie Sloan Chalk Paint. These colors coordinated perfectly with the gold and brown on the glass top. 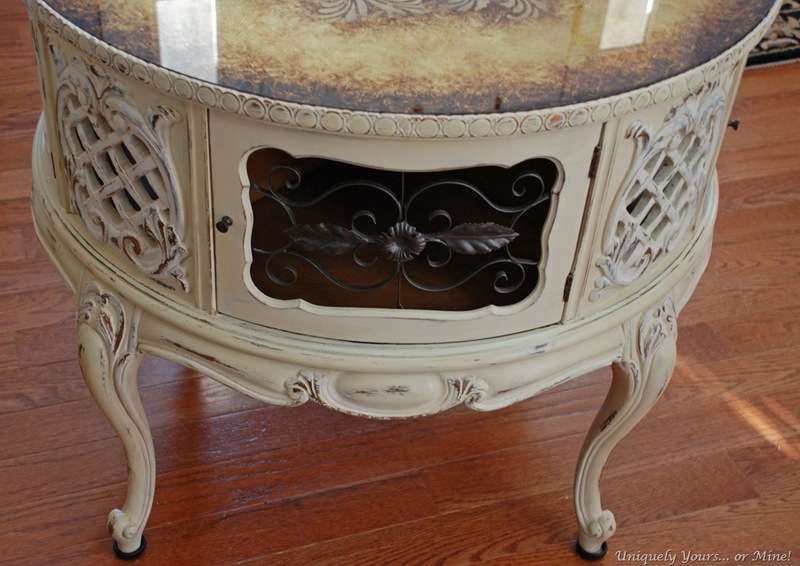 One of the areas I highlighted with the Pure White chalk paint. 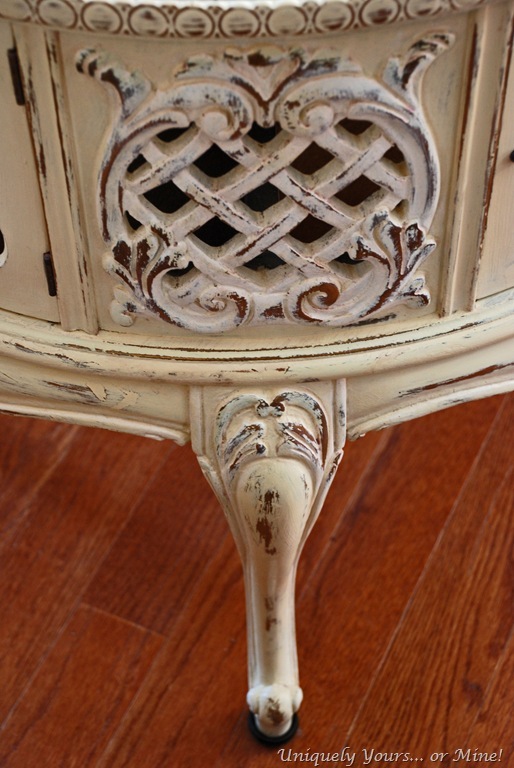 I lightly distressed the entire piece and waxed it with Annie Sloan’s clear wax. Annie’s wax is just is so creamy that I find it works best for pieces with a lot of detail… I used a wax brush to get into all of the grooves… I also sprayed the new knobs and the metal inserts a brown metallic, sort of like ORB but not exactly, it blends in perfectly with the entire piece. Sorry about the reflection on the top, I had a hard time finding a place to photograph this… but it is just so pretty! 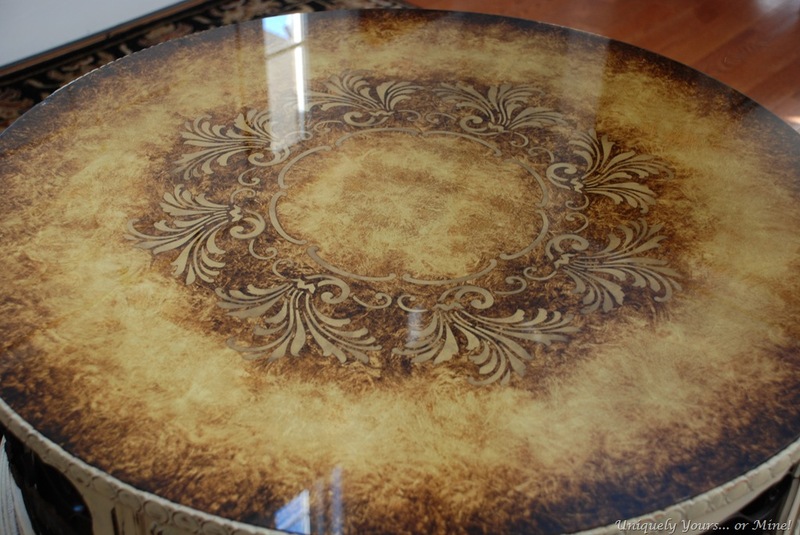 This table 31.5” in diameter x 28” tall… it’s a rather large size… where or how would you use the table? I’m sure there is a name for this kind of table, of you know what it is please let me know! I also like that you often stain (or leave as is) the top of furniture instead of painting all the surfaces. Hoping to visit your booth on Nov. 16 in Ashland. 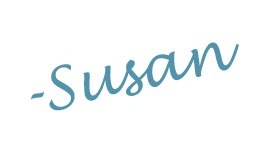 Susan this is just beautiful and so different. The detail is just stunning. I’m gonna have to covet this table. Great job on a great fine. Very unique and oh so pretty! Susan this piece is AMAZING!! Thanx for sharing it with us at THT. I still can’t get over how beautiful it is! Lovely table, and your work made it perfect! Nice job. Beautiful table, Susan! I love that top and I’m glad you left it. The Old White and Pure White looks great with it, too. Super find! Lucky you!! I’m always on the lookout for something unique looking such as this. You did a great job with the ASCP! Enjoy it! The color you chose is perfect. That table is absolutely GORGEOUS!!! You made this wonderful table look gorgeous. Good work. What a cool table! Thanks for sharing at the PoPP. I’m featuring it in the Spotlight this weekend. Really pretty! Great color choice for that glass. Wow! What a lovely piece! The whites and creams are perfect with the top. Great job! Very nice piece. I worked on what I’m thinking is some sort of french style side table today. Similar color is used on the sides and legs as that’s one of my favorite colors. I love your table! I have the same table in the original look…I was just wondering how much something like this might be worth? I really couldn’t say, I think I bought it for under $100.